A few months ago I signed up for the Handstand App while they have a promotion going to try a for a free workout with any one of the personal trainers featured on the App. So of course I jumped at a Free session. I chose to do a boxing session with a trainer named Lucas. Watch My Workout Session with Lucas! The Handstand App is a on-demand personal training app for the busy professional who doesn't have time the gym! You are able to workout on your own time and the trainer comes to you. You can search for trainer by price, specialization and time slot availability. You choose the workout and trainers vary from martial arts, boxing, cardio, weights, yoga, pilates and so much more. Initially Handstand offered sessions as low as $15 but they seem to have changed the pricing to a flat rate of $59 per session which in all honesty having some background in the personal training business seems much more realistic considering the going rates for trainers through traditional means. 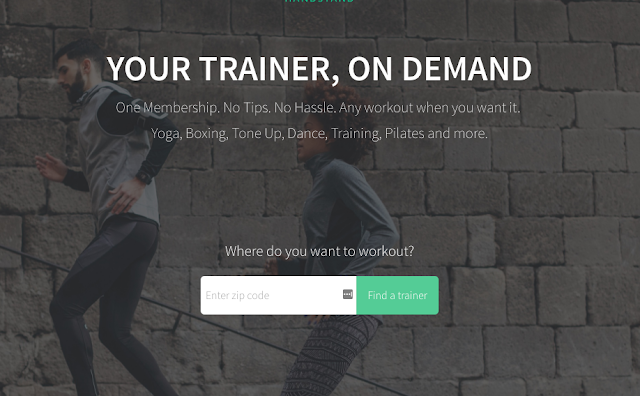 Considering that Personal Training is a relationship business, I think this is a great app for facilitating introductions between personal trainers and new clients. However, I think the app needs a bit of work in order to compete with the many, many other apps that are out there. Some of the perks that take the stress and pressure off of trying to find and build a relationship with a personal trainer are that Handstand does all of the background checks and insurance verifications. You also don’t have to worry about payments,etc because all of that is taken care of via the app -kinda like Uber. So no weirdo’s are coming to your house. Presently, Handstand is only available in the Los Angeles region but according to their site, they have plans to expand to other major cities soon.